Matthew Lewis is an Assistant Professor in the Department of Design at The Ohio State University. He holds a joint appointment with the Advanced Computing Center for the Arts and Design (ACCAD) in the College of Arts and Sciences where he has taught and collaborated on faculty, staff, and student research projects since 1992. 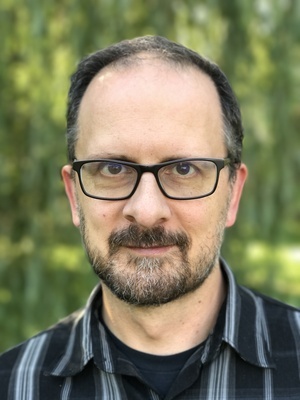 He is additionally affiliated with the Translational Data Analytics Institute (TDAI), the campus hub for big data analysis and visualization research. Dr. Lewis’s current research is in the areas of emerging technologies and generative processes in the arts and design. In particular, he is investigating the use of novel data acquisition, fabrication, and display systems for interactive performance, installation, and data visualization applications. He has taught courses on creative coding, interactive performance and installation technologies, virtual environments, 3D animation, digital lighting, and procedural animation. He has presented generative art and design research and artwork internationally.